Latest Euro 6 Engine. Immediate Delivery. Comes with 5 yr/130,000km warranty. Ready stocks @ $56,800. 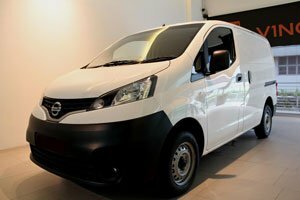 » View all the Nissan NV200 that are Ready Stock. Authorised Distributor Nissan cars are Nissan Cabstar Petrol, Nissan Elgrand, Nissan GTR, Nissan Leaf Electric, Nissan Note, Nissan NV200, Nissan NV350, Nissan NV350, Nissan Qashqai, Nissan Sylphy, Nissan X-Trail. Parallel Imported Nissan cars are Nissan Cabstar, Nissan NV350.